It's no mystery that the bee population is in trouble. Between 2008 and 2013, the bee population in the U.S. declined by about 30 percent. Across the border, Canada's bee population is also in decline, due to habitat degradation and the use of harmful pesticides. Now, Honey Nut Cheerios is becoming part of the conversation. Their new Canadian boxes will soon temporarily be hitting the shelves without their bee mascot, Buzz, according to Adweek. 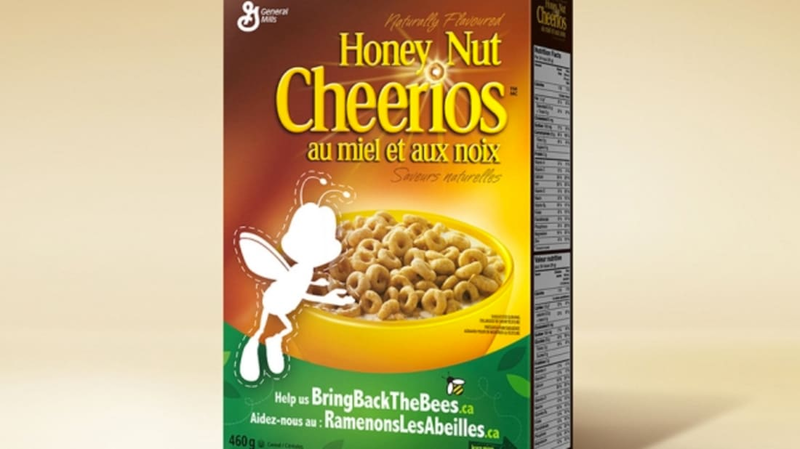 "This is the first time in the brand's history that we've taken 'Buzz' off the box," Emma Eriksson, director of Marketing for General Mills Canada, said. "One-third of the foods we depend on for our survival are made possible by the natural pollination work that bees provide. With ongoing losses in bee populations being reported across Canada, we wanted to leverage our packaging to draw attention to this important cause and issue a call to action to Canadians to help plant 35 million wildflowers—one for every person in Canada." The campaign, which runs from March to July, is meant to draw attention to the declining bee populations and inform people how to get involved. Along with the missing bee, the company set up a website called Bring Back the Bees. The site explains why bees are important and what we can do to protect them. Honey Nut Cheerios is giving away 35 million seeds for free to help bring back the little fuzzy insects. They are also offering a contest that will give winners a $5000 garden makeover. The brand will be making an appearance at the Canada Blooms Festival and handing out an impressive 50,000 Veseys wildflower seed packs to guests.